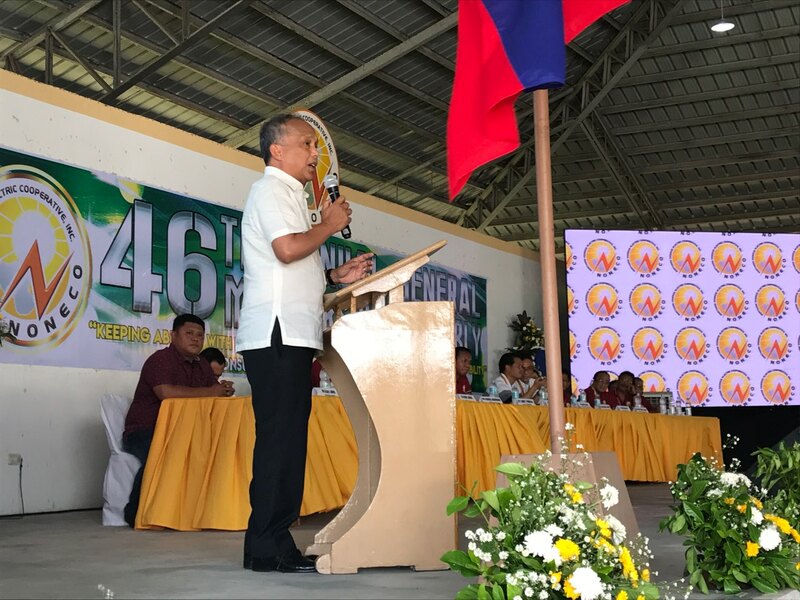 TOTAL ELECTRIFICATION: Energy Secretary Alfonso Cusi addresses the 46th Annual General Membership Assembly of Northern Negros Electric Cooperative, Inc. (NONECO) on Sunday (27 May) during which he vowed to pursue total electrification of its coverage areas. 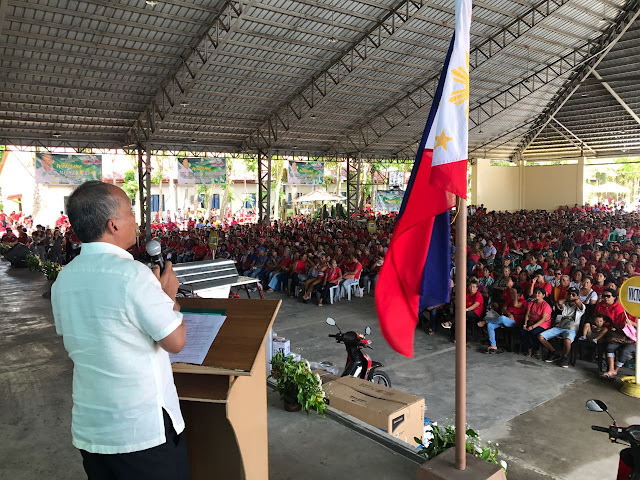 Energy Secretary Alfonso Cusi reiterated on Sunday (27 May) the government’s plan to provide electricity services to the whole of Northern Negros, as well as all communities across the country so that present and future generations can be empowered. On the occasion of the 46th annual membership assembly of the Northern Negros Electric Cooperative, Inc. (NONECO), Cusi asked NONECO to closely coordinate with the National Electrification Authority (NEA) to fully realize its electrification plan. Cusi said that the Department of Energy (DOE) endeavors to remove the challenges in providing electricity to all communities across the country so that Filipinos are assured of a brighter future. "We have to act now [on electrification], because our children on areas without power are already in their growing years,” said Cusi. “We cannot take back the time when they have to read their school lessons at night without having a conducive environment for learning,” he added. Data from NEA showed that NONECO has electrified 158,629 households as of March 2018, out of its baseline data of 200,000. This means, 21% of NONECO's franchise area, or nearly 41,000 households remain unserved or underserved. At the same time, Cusi underscored the need to introduce smart grid technologies all over the country because of their proven efficiency in significantly reducing systems losses and other operational inefficiencies. He also called for the adoption of the Resiliency Compliance Plan (RCP) which aims to make the power industry resilient to both natural and man-made calamities. The RCP outlines best practices in disaster management that will make the energy sector more sustainable. According to Cusi, consumers, as members of the Third Party Bids and Awards Committee (TPBAC) under the Competitive Selection Process should also be involved in the process of contracting agreements to ensure transparency. The committee is involved in reviewing and approving power supply contracts of a certain power distribution utility (DU). "Once implemented, the consumers can have a representation in the DU's power supply contracts, and will result in a more favorable and lower electricity rates,” said the DOE chief. Cusi is also asking public support for DOE’s initiative to reflect the unbundled electricity rates under the proposed standard electric bill format across all DUs. "We find the need for DUs to provide such information to our consumers so that they will know what they are paying up to the last peso. This advocacy [standard electric bill format] is for all of us to become more informed electricity consumers, thereby becoming more empowered." 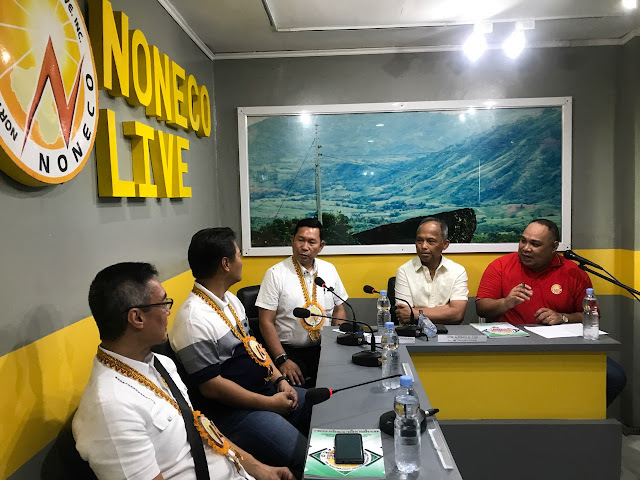 NONECO is serving nine towns in the region: the cities of San Carlos, Escalante, Sagay, Cadiz, and Victorias; and the municipalities of Calatvara, Taboso, Manapla, and Enrique B. Magalona. CUSI WITH NEGRENSES: Member-consumers of the Northern Negros Electric Cooperative, Inc. (NONECO) listen intently as Energy Secretary Alfonso Cusi delivers his keynote address during its 46th Annual General Membership Assembly on Sunday (27 May) where he discussed initiatives of the Department of Energy to address energy security issues. ENERGY ISSUES: Energy Secretary Alfonso G. Cusi together with National Electrification Administration (NEA) Administrator Edgardo Masongsong tackle energy issues during the radio program of the Northern Negros Electric Cooperative, Inc. (NONECO), which held its 46th Annual General Membership Assembly on Sunday (27 May).